Google Forms have been extremely popular amongst schools and school leaders. Using Google Forms to do walkthroughs has been my practice for several years. One of my first posts on this site was a tutorial on how to use Forms to collect walkthrough data as well as to provide emailed feedback to teachers. Last year, I switched the Add-on that I use to merge the data and send the email to the teacher. I now use autoCrat, a much more user friendly Add-on that will make your life easier. Below, you will find directions and links that will allow you to copy my walkthrough form and set up a system that will collect school-wide data while providing timely feedback to your teachers. You will need to be logged in with your Google Drive account. Click the following links and make copies of each of the following items into your own Drive account. I recommend creating a “Walkthrough” folder to house these documents. Copy Google Form “LEADministration Walkthrough” by clicking here. Click make a copy. Copy LEADministartion Walkthrough Email template by clicking here. Click make a copy. Copy LEADministration Walkthrough Response sheet by clicking here. Click make a copy. Once you have each of these docs saved to your Drive, you are ready to set up the email feature using the autoCrat add-on. 1. In the response spreadsheet. Open autoCrat Add-on. Allow autoCrat access to your Drive. 2. 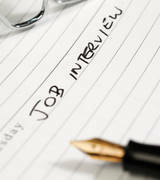 Click “New Job” and name the job. I used the name “walkthrough”. 3. Choose template from drive. Use walkthrough email doc which was copied from link above. 4. Match tags which are marked with << >>. This will pull data from spreadsheet of walkthrough and merge with other documents like your feedback email. 5. Name how the files will be saved in Drive. I like to use <<Teacher>> <<Timestamp>> which will save a record of the emailed document to a folder in your drive and name the document the teacher’s email address as well as a timestamp of when the form was completed. 6. Set merge condition. Add condition, then set Timestamp to Not Null. This will trigger email to be sent once form is completed. 7. Set up email to be sent. Use tag <<Teacher>> in “To” line of email. This will populate with email address selected in Google Form. Remember you must use teachers’ email addresses in drop down of Google form. Title the email. Copy and paste all of text from “LEADministration Walkthrough Email” into body of email. Not all data from the form is sent to teachers. I like to keep some data for school-wide purposes which aren’t always useful to teachers. 8. Set triggers. Select Yes on run on form trigger. This will trigger email to be sent when you submit observation form. 9. Lastly, add all of your teachers’ email addresses under the Teacher drop down. This will get you started on using this form to do walkthroughs and collect school-wide data as well as provide teachers with feedback. If you modify the form to collect different information, you must also modify the email template, the <<tags>>, and the autoCrat job. Rigor is creating an environment in which each student is expected to learn at high levels, and each is supported so he or she can learn at high level, and each student demonstrates learning at high level. (Blackburn, 2008). By this definition, rigor requires high expectations, support, and a student product that allows students to demonstrate their learning. In other words, we expect students to perform at high levels, yet we still provide support for these students. Expectation and rigor can be very abstract concepts. If we want our rigor to increase, we need to have a method to measure rigor. In the past, we have used Bloom’s taxonomy to measure rigor. Unfortunately, it is difficult to quantify Recall, Analyze, Create, etc. A seminar this summer introduced me to Webb’s Depth of Knowledge scale. This would allow us to quantify the depth of knowledge to which our teachers are instructing. 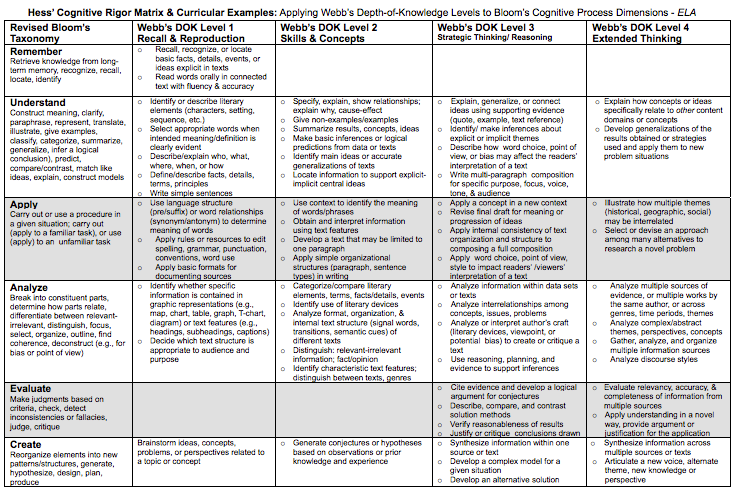 Hess’s Cognitive Rigor Matrix combines Bloom’s and Webb’s to produce a very effective tool for teachers and school leaders to measure the level of rigor in our classrooms. Teachers often ask “what rigor looks like?”. This matrix gives clear examples of how to move our instruction “down and to the right”. During class walk-throughs we use this matrix to measure student products as well as the questioning in the classroom. Teachers use the matrix in their planning to gage their lessons. This has been one of the best tools that we’ve used this year. There is a matrix for Math/Science, Reading, and ELA. Connecting with the community is one of the greatest challenges of every school that I’ve worked in. Too often, we settle for the excuse of “That’s just the way it is in (fill in any town in America)”. I would argue that communities that are the most difficult to engage are the communities that most desperately need to be heard from in order to improve our schools. In the coming school year, we will be using Celly to connect with parents. Cell is a free service that allows users to create “Cells” or groups of users that can engaged in a text message dialogue. Cells can be set up for classes, teams, clubs, PTO, or the entire school. Users create accounts, then sets up Cell. Other users can set up an account using their cell phone, then join the cell that was created. Once they join, they will be able to participate in the text dialogue. “Report cards going home today, make sure you ask your child and celebrate their hard work!”. It can also be used to poll participants to get feedback. This will make for an easy way to get community feedback on school decisions. For someone who doesn’t like the sound of his voice, Celly is a much preferred option. When I record a message using our Alertnow system, I record and rerecord the message at least 4 times. I would much rather send a text alert. This will be a great resource for connecting with families and ensuring a two way dialogue. Text-a-Tip. Using Google Voice Text Messaging to Report Bullying in Schools. Bullying is a problem in every school. School leaders must take proactive measures to ensure the safety and comfort of every student in the building. Students will not learn if they are not comfortable. As much as we encourage every student to come to administration with reports of wrongdoing, it doesn’t always happen. After a meeting with my principal, we decided to add another resource to our fight against bullying. We want students to be able to text message us directly to report anything that they would not be comfortable doing in person. 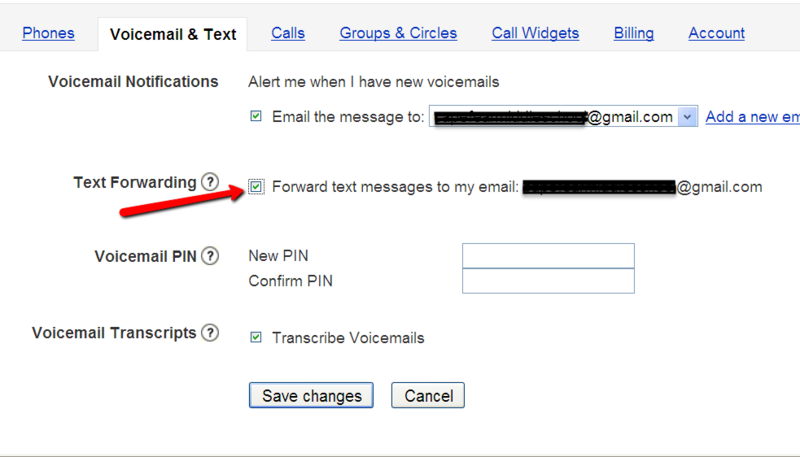 Using Google Voice, we were able to set up a free account. This will allow students to report discipline violations through text messaging. While we just established the service, I believe it will be a great resource to our school’s fight against bullying. Google Voice is a free service that has a ton of great features. If you’d like to learn more, be sure to visit their sight. Our school district uses Google email services, but the feature of Google Voice was blocked. I had to set up an alternate email address for our school. This wasn’t a problem because I was able to forward all received texts to my work email. Using Teachers Pay Teachers.com to Inspire Learning??? I’m toying with the idea of using the website TeachersPayTeachers.com to inspire learning in my school. Within the past few weeks, there have been many articles published on the success of Teachers Pay Teachers. As a teacher, I came across the website many times while looking for ideas for my classroom. I never could justify spending money on a lesson, but apparently others do. To date, the site has processed over $7,000,000 in sales. Most of that money goes directly to the teachers that produce the content. I’d like teachers in my school to start using the site to sell their lessons. If this were to happen, I believe, it would increase student achievement at my school. Bad lessons don’t sell. Not that any of my teachers create bad lessons, but there is always room to grow. With the extra incentive of possibly earning revenue, teachers would put a little more effort into making original and content specific lessons. Not only would money motivate, but if teachers have an audience outside of their students and administration, they might spend more time to perfect their product. I know that it isn’t a guaranteed thing, but I think that it would challenge our teachers to spend more time in the planning stages of teaching, and possibly earn them extra income. Thanks Sarah for such a great visual. Thanks to the 7.2 million teachers who spend so much of their time, money, and effort on our students. Educators spend so much time educating, we forget to get educated. Of all the efforts that schools put into increasing student achievement, professional development has one of the best return ratios. The problem that schools have, is that we don’t know how to choose and implement professional development very well. In this post, I examine how professional development impact students achievement, and what can we do to ensure professional development is working for our school. Good teaching starts with good learning. In 2007, the American Institute for Research found that teachers receiving at least 49 hours of professional development in a six to twelve month span could expect to increase student achievement by approximately 21 points. This is a staggering figure. There isn’t a school in this country that would not want to increase student achievement by 21 points. So, what is holding us back? Below are some tips for making professional development work for your school. 1. Make learning part of the school culture. Professional growth should not be an afterthought. It should not be something that is done once a month to meet the district requirements. Every adult should be expected to, and desire to grow for the sake of helping the students. School leaders need to make this part of the vision of the school, it should be central to everything that happens on a daily basis. 2. Make it work for everyone. If we are to shoot for 49 hours, then we need to be proactive in helping teachers find the time. Schools would have to dedicate 1.36 hours per week (in a 36 week school year) to meet the 49 hour goal. One way that our school is creatively meeting the needs of our teachers is by moving our professional communities online. Using Edmodo, we have given our teachers the ability to use any available time to connect with others and grow. 3. Remove the obstacles. The time that teachers have with others is limited, don’t fill that time with mundane details. Use department and staff meetings to learn and grow together. When you have your staff together use the expertise in the room to help everyone grow. If you are standing in front of your staff giving information that could be sent via email, you are wasting a precious commodity, time together. 4. Make it relevant. Ask teachers what they need to become better. Then ask your teachers what training/expertise they can offer to the staff. Encourage teachers to try new things, become experts, then train others. The extra incentive/pressure of teaching others is a great motivator.